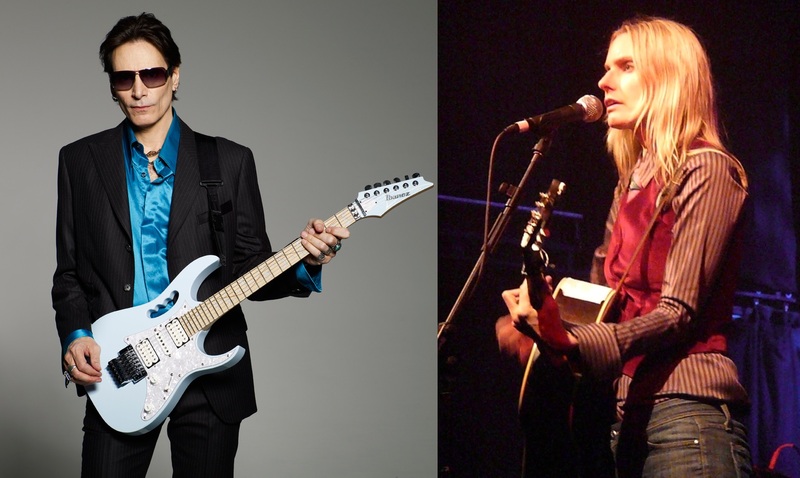 Unless you’re a fan of instrumental rock guitar music, Steve Vai is likely to be an unfamiliar name. In the 1980s, a school of intensely technical metal guitarists working in what we could call the post-Van Halen style, who came to be known as shred guitarists or shredders, colonised the pages of guitar magazines, defining the parameters of what was thought of as rock guitar, a situation that endured until the early 1990s. When we talk about shred guitar, we’re talking heavy distortion, fast tremolo picking, hammer-ons and pull-offs, sweep picking, dive bombs with the whammy bar, an exaggerated vibrato technique and 2-handed tapping. Essentially, lots and lots of notes. Vai was one of the titans of this school of playing. While Vai’s one-time teacher Joe Satriani was given to a notable degree of lyricism in his playing, and Yngwie Malmsteen was identifiable from the pseudo-classical motifs in his work (and his absolute lack of humour about himself), Vai was the weird one. Vai’s the guy who created his own Xavian scale by dividing the twelve tones of the European tempered scale into 16 on a synthesiser and having a custom guitar made to allow him to play his new intervals. Vai’s the one whose career takes in work with Frank Zappa, Public Image Ltd and, uh, Whitesnake. If I’m honest, Vai is someone whose work I was passingly familiar with (one of my best friends in high school was a fan), but who I had put in the “Not for Me” box. There’s a lot of people in my Not for Me box, but nothing in this life is hard and fast: one-time residents of my own Not for Me box include Steely Dan and Neil Young. Aimee Mann is very much For Me. Singer-songwriter, thoughtful lyricist, undemonstrative, almost conversational singer, big Beatles fan – this is stuff I get on board with. But for someone who’s often been accused of essentially making the same album over and again, Mann’s career is musically pretty wide-ranging, taking in the fractured post-punk of the Young Snakes and the MTV-friendly synth pop of Til Tuesday as well as her solo albums which are more musically diverse than is often assumed – 1995’s I’m With Stupid carried a discernible Britpop influence; 2005’s The Forgotten Arm is a 1970s-style southern rock record; Lost in Space, from 2002, plays with static, white noise and time-domain effects throughout its running time to suggest unknowable blackness and unimaginable distances. What I’m getting towards is that Mann is an underrated musical force, as opposed to merely (merely!) a songwriter. She was at Berklee College of Music at the same time as Vai, initially as a voice major, before switching to bass and starting from scratch. Til Tuesday’s arrangements often leaned heavily on Mann’s bass playing, from the slap-and-pop riff of Love in a Vacuum to the subtly reggae-influence off-beat feel of What about Love (try singing and playing bass. Now try singing on the beat while playing bass on the offbeat). Listen to 50 Years After the Fair on Whatever where she has the unenviable task of hanging out on bass on while Jim Keltner plays drums; unenviable because, if it hadn’t grooved, only one person could have been responsible. It grooves. I imagine I’m not the only long-time fan who regrets the absence of Mann’s own bass playing on her more recent records. So when Vai took the advice of his wife (an old college friend of Mann’s) and asked Mann to work with him on a piece he’d been writing, it wasn’t at all the unlikely partnership that it might have seemed on the surface. On No More Amsterdam (as the finished song was called), their approaches meshed beautifully. The chief pleasure of No More Amsterdam is the contrast between the winding, slowly unfolding verse melody, with its time-signature changes and tricky syncopation, and the short phrases of the chorus that Vai and Mann sing in harmony, which keep climbing in pitch even as they repeat in phrasing. The two singers trade verses (and later on lines within verses), adding a layer of complexity to the narrative – are the “I” and “you” referred to throughout the song stable? In the verses, Vai seems to get all the “I” pronouns and Mann the “you”, suggesting that his character is the protagonist, with Mann an observer, but the song permits other interpretations – it’s a typically clever piece of writing from Mann, the intricacy of Vai’s music pulling something out of her that’s unlike anything she’s done on her own records. It’s a lovely song, and it’s got me wishing that Vai did this kind of thing more regularly. I can’t think of anything else in my record collection that is comparable musically, and I’m not sure there is a singer-songwriter who has the instrumental chops and inclination to play on this turf. So Vai and Mann had better make it a full album next time. This entry was posted in Music and tagged 50 Years After the Fair, acoustic guitar, Aimee Mann, bass, bass guitar, bass playing, Berklee College of Music, Britpop, dive bombs, Eddie Van Halen, Frank Zappa, groove, hammer-on, I'm With Stupid, instrumental rock guitar, Jim Keltner, Lost in Space, Love in a Vacuum, MTV, Neil Young, No More Amsterdam, Public Image Ltd, pull off, shred guitar, shredder, shredding, slap bass, Steely Dan, Story of Light, sweep picking, syncopation, The Beatles, The Forgotten Arm, The Young Snakes, Til Tuesday, time signature changes, time signatures, tremolo picking, vibrato, What About Love, Whatever, Whitesnake, Xavian Scale on May 7, 2015 by rossjpalmer.